Cucumber & Caviar — always with butter. 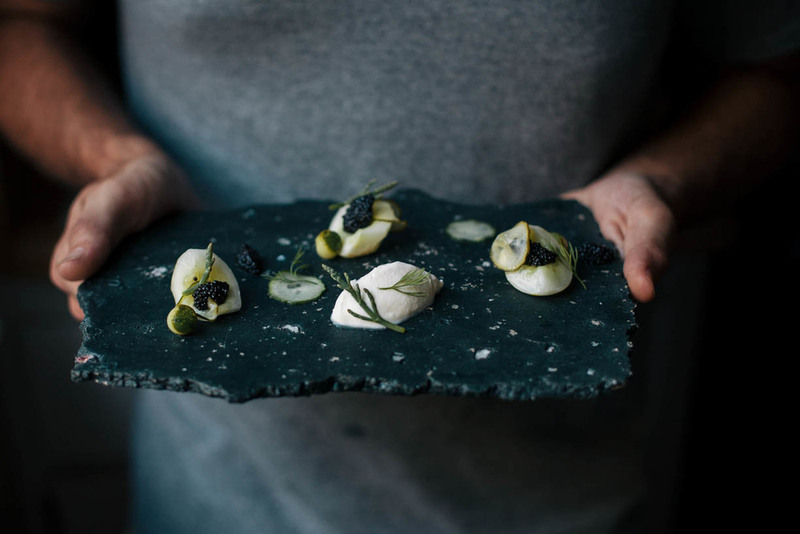 Creme fraiche and caviar. Lets be honest, I did not eat this. I don't do white food and am a vegetarian. He liked it very much though. I did sneak a few sea beans though. It was my first time having them. Like the ocean in your mouth. But they are so small it is a nice little salty touch. Bring the vinegar, water and sugar to a boil. Add all other ingredients except the cucumber. Slice cucumber thinly. Then remove from heat and pour over cucumber slices. Chill and let sit for 24 hours. Slice the lemon cucumber into thirds. Melon ball the english cucumber. Remove the woody part from the sea beans. Pick the dill plushes. Arrange: Dress the cucumber, balls, sea beans in the pickling liquid and olive oil and salt. Arrange on the plate. Top with caviar and dill. Add creme fraiche.